Deep in the jungle, slaughtered pet dogs are trafficked in the dead of night across the river to be turned into £30 curry: Exclusive dispatch from the frontline of the war against Thailand's medieval dog meat trade. In the clammy midnight darkness of a jungle clearing in northern Thailand, two police officers and a woman investigator crouch beside a pile of cages containing more than 500 howling dogs. Yards away, a gang of heavily armed men move through the trees to encircle them.Terrified, outnumbered and cornered after tracking down a cargo of animals hidden in the jungle before being smuggled to neighbouring countries, the police officers appear doomed to pay the ultimate price for meddling in the brutally lucrative dog meat trade. As the tide of panic rises, one officer jumps to his feet from behind the crates and draws his revolver. Firing rapidly into the air, he runs around the clearing shouting out to imaginary colleagues to trick the smugglers into thinking more police are hidden in the undergrowth. The desperate gamble pays off, sending the gunmen into retreat and buying the cornered trio enough time for reinforcements to arrive as the gangsters melt away into the surrounding jungle. 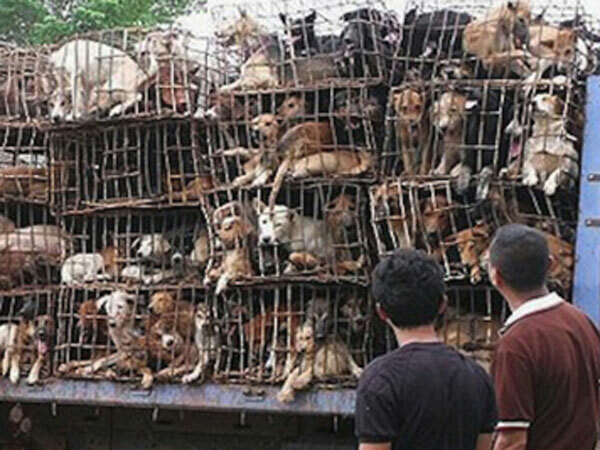 This is the frontline of the war against the dog meat trade – a bleak and perilous struggle to stop hundreds of thousands of dogs a year being snatched from the streets and then smuggled and slaughtered in horrendous conditions for their meat. Thousands of miles away, nearly 500,000 people have now signed an online petition calling on the Thai government to outlaw the trade after a harrowing video appeal by Ricky Gervais, Judi Dench and Downton Abbey stars went viral last week (October 2014). 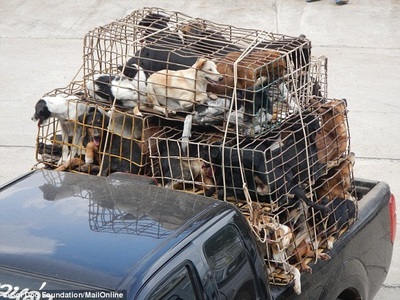 But as a Mail Online investigation in Asia found, bringing an end to the savage trade which claims the lives of millions of dogs a year is a monumental challenge with the lives not only of dogs as stake but also those of the people dedicated to ending the slaughter. With huge profits at stake, the smuggling gangs are ruthlessly switching tactics to ward off the threat to their trade – and have started slaughtering dogs before they leave Thailand to reduce the chances of live cross-border shipments being detected. The industry is reckoned to be worth around £20 million a year in Thailand alone and is driven by highly organised criminal gangs involved not only in the dog meat business but in narcotics and human smuggling. The struggle against the dog meat trade in Thailand is being championed by British-run charity Soi Dog Foundation which commissioned the video appeal and whose chief investigator, Mrs Ha, was caught up in the jungle raid in May which nearly ended in tragedy. A diminutive married woman in her late 40s, Mrs Ha – whose real identity is being kept secret because of the risk of her being targeted by smuggling gangs – has helped in dozens of arrests and the blocking of shipments of thousands of dogs in the past year alone. Her efforts are focussed in the lawless Tha Rae area of northern Thailand where stolen dogs are caged in secluded jungle areas before being smuggled across the border to Laos and then on to Vietnam where an estimated five million dogs a year are eaten.It was in the jungle near Tha Rae that Mrs Ha found herself surrounded by the armed gang. 'Of course I'm scared about what might happen to me but I can't give up and I'm going to carry on with this fight,' she told Mail Online calmly. Most of the dogs rescued by Mrs Ha and her team members are much-loved pet dogs snatched at night from homes across Thailand for the equivalent of a few pounds each by thieves who drag them with ropes behind motorbikes before selling them on to dog meat gangs. 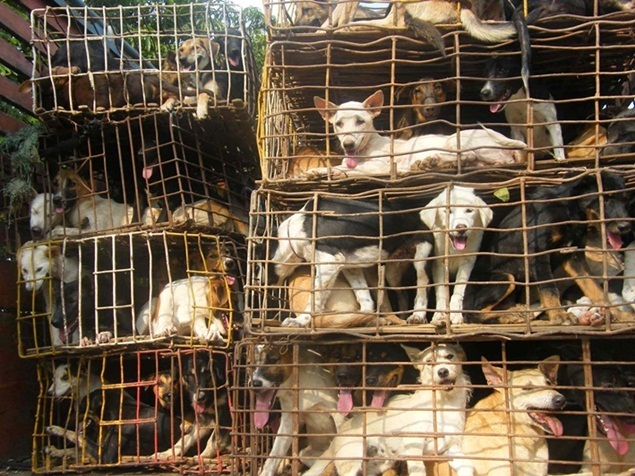 Crammed together in metal cages in which many of them die, up to 1,500 dogs at a time are then taken up to hundreds of miles by lorry to jungle camps in northern Thailand where they remain in the cages in stifling heat for days waiting to be smuggled to China or Vietnam. 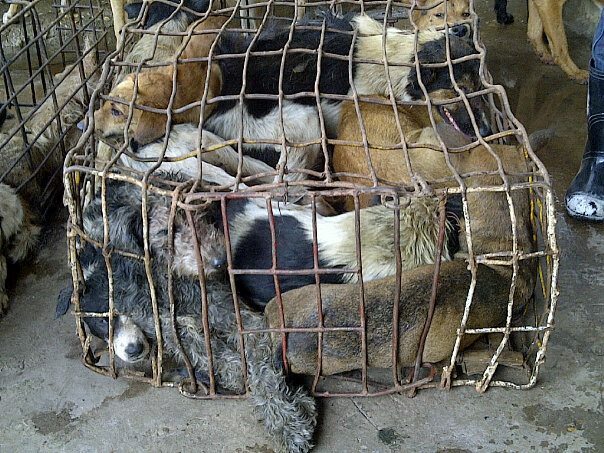 Their ordeals finally end when they are beaten senseless with metal pipes, immersed in boiling water to loosen their fur and skinned – often still alive – before being served up in restaurants from Beijing to Hanoi where dog dishes can cost up to £30. As part of a campaign that has only dented the dog smuggling trade in Thailand, giant posters paid for by overseas donors have been put up across northern Thailand offering rewards of £100 for information leading to the arrest and conviction of dog smugglers. The Soi Dog Foundation also pays bonuses to police officers who take part in operations, according to founder John Dalley – a 65-year-old former chemical engineer from Leeds who set up the charity after retiring to Phuket in Thailand with wife Gill 11 years ago and now provides shelters for some 2,500 rescued dogs. 'You might argue it's immoral to pay rewards to police officers,' he said. 'But I look on this as a war, and we have to do what we can to stop this trade. It is proving effective and it's worth the outlay if we can achieve that goal. Up to last year, an estimated 500,000 dogs a year were being smuggled across the Mekong River from Thailand to Laos and then on to Vietnam, where dog meat is a popular dish with young middle-class men who believe it makes them more potent. Pet dogs snatched from homes across Thailand at night were sold to gangs who could make tenfold profits on shipments of stolen dogs as soon as they crossed the Mekong River to Laos, with local border guards bribed to turn a blind eye. Now, thanks to an anti-rabies agreement between Thailand, Laos and Vietnam last year bringing in tougher penalties for the trans-border shipment of live dogs, there has been a sharp decrease in the cross-border smuggling of live dogs. 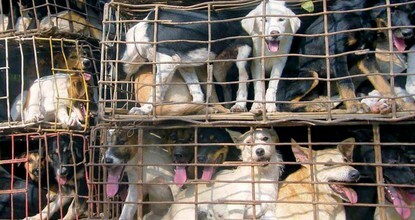 WATCH: Judi Dench & Downton Abbey stars condemn 'devastating cruelty' of dog meat trade. In its place, however, equally brutal methods of profiting from the trade have emerged. 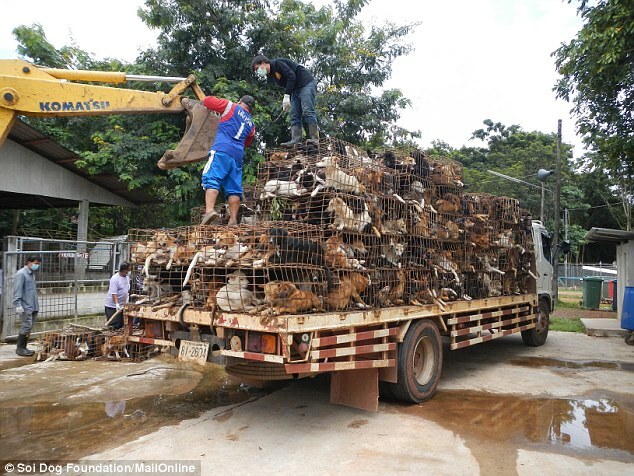 Dogs are now slaughtered and chopped up in the jungles of northern Thailand clearings and then smuggled silently across borders in ice buckets on the back of lorries. A raid conducted by police and investigators on an illegal tannery in Sakhon Nakhon, northern Thailand, on October 17 found scores of dead dogs lying across the floor and strung up to be skinned. Meat was being sold for both domestic and overseas consumption. 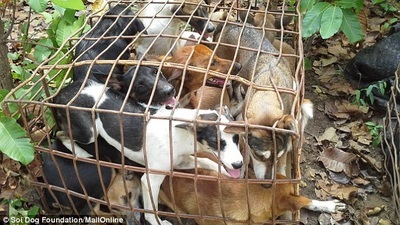 Sources in the dog meat trade have told investigators that another major dog meat trader in the area is breeding and slaughtering weeks-old puppies to be smuggled out of Thailand sold as single-meal delicacies for diners in Vietnam and China. Days after the raid at Sakhon Nakhon, the Soi Dog Foundation received a pitiful email from a desperate pet owner saying he believed his dog was among the animals found there. 'She is a much loved pet who was stolen at night from our home,' the pet owner wrote. 'We are just praying that she survived. We know it is a slim chance but please help us if you can.' Sadly, by the time investigators reached the scene, every single dog was dead. As the stakes are raised in the fight to end the dog meat trade and greater pressure is exerted on the gangs, Dalley knows the potential risks to himself and his investigators from the gangs behind it are escalating too. Buoyed by the runaway success of the online petition, the key objective of the Soi Dog Foundation and its supporters is to persuade the Thai military government to bring in laws that act as a deterrent against the snatching of dogs to be sold into the dog meat industry. Currently, the highest penalty for animal cruelty in Thailand is a £20 fine. Dalley and his supporters want that replaced by a tougher new law that would carry a maximum penalty of one year in prison and a fine of £400 – still low by international standards. The petition being circulated with the video appeal calls on the Thai government to clamp down on the trade by making the eating of dogs, the skinning of dogs and the trafficking of dogs illegal. It also highlights the danger to humans of the unregulated trade from dogs that may be carrying rabies and can spread diseases such as cholera and trichinellosis. 'This isn't only about animal welfare – it's about human welfare,' said Dalley. In the meantime, the war against the smuggling gangs remains in the hands of a small but determined group of people including the indomitable Mrs Ha who insists she will never give in to the gangsters behind the trade. 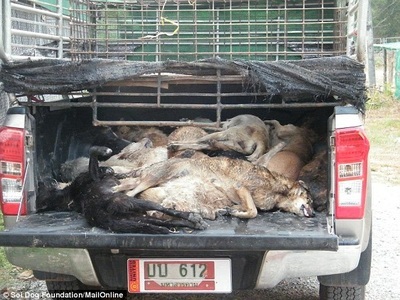 "Dog-Meat Mafia" Fuels Thailand's Canine Trade from Digital Global Mail Limited on Vimeo. "Dog-Meat Mafia" Fuels Thailand's Canine Trade In Thailand stray dogs and pets are being illegally snatched, bought, or even bartered for household items, then smuggled to Vietnam, where they are sold, butchered and eaten. October 2012 - A British journalist working on a documentary investigation into what happens to animals that are supposedly freed from those involved in the illicit business finds that in three out of four cases a Vietnamese dinner plate is exchanged for a Thai grave. Photos taken immediately following a raid on a canine meat traders’ compound in Sakhon Nakhon province in January show dogs seemingly relieved to have escaped from the tiny cages into which they had been crammed. Wide-eyed puppies can be seen among well-groomed dogs with collars - which, along with their ease among volunteer workers, suggests many of the animals supplying the illicit trade were people’s pets. Dogs of Thailand, by John Keeble, a former Fleet Street journalist with more than 50 years in the business. Keeble has been coming to Thailand since 1975 and has lived here for six years. 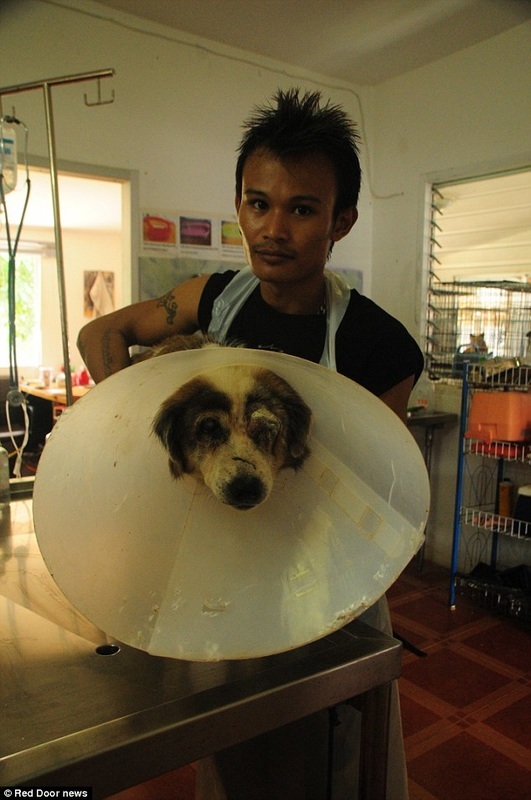 His lifelong passion for animal rights drew him first to the Soi Dog Foundation and from discussions with people there to the plight of animals trapped in the dog meat trade. He decided on the documentary series as the best way to get across his message. The fates of the dogs pictured in the opening minutes of Keeble’s documentary, 1,968 of them seized from a trader in Sakhon Nakhon’s tambon Tha Rae, serve as a case study answering the question of what happens to dogs once they are ”rescued” from traders. 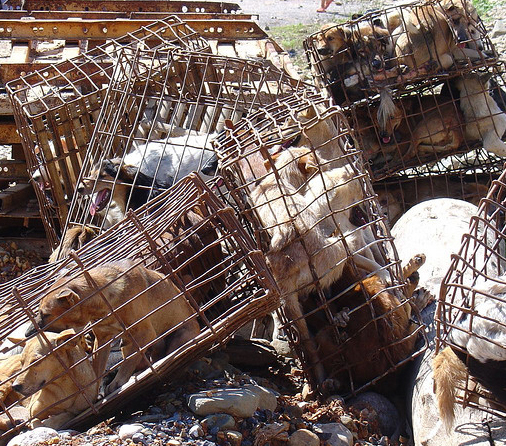 Citing the seven month period leading up to March, 2012, Keeble found that of 6,500 dogs that had been rescued from canine meat traders, 4,700 are now dead or missing. 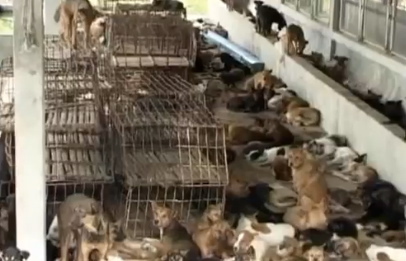 As shown in his video, the shelters are crowded and lacking in veterinary care. 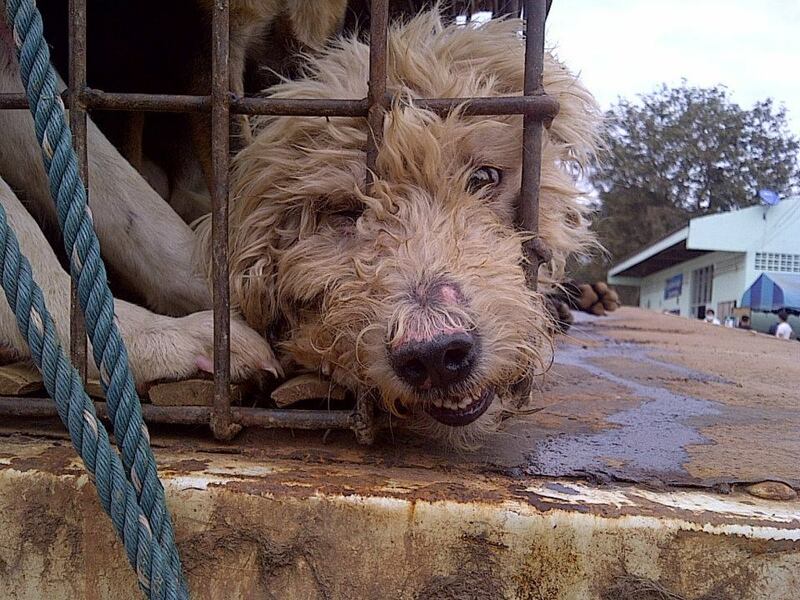 The dogs come from the traders sick and wounded and do not have access to veterinarian care. The animals end up suffering extreme heat exhaustion from the relentless sun and high temperatures. 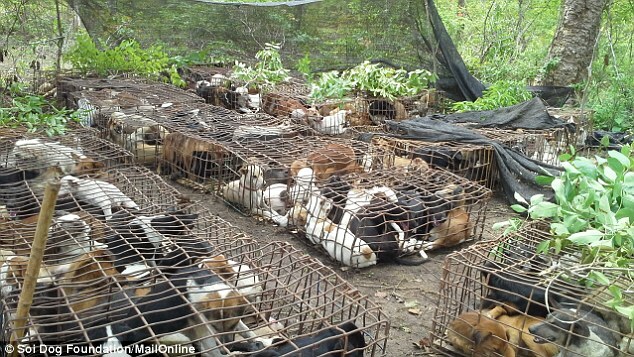 Keeble decided to hone in on the journey Sakhon Nakhon dogs seized in January, in part to help explain how what begins as a move ostensibly to protect the animals’ welfare often ends in disease and death. At the time of their capture, there were no funds for foods or veterinary assistance. However, political officials, police officers and volunteers reached into their own pockets to feed the animals before their ill-fated journey south. After they were seized in Sakhon Nakhon by police who conducted the raid, the animals were counted, once upon arrival and again upon leaving the facility bound for a Buri Ram shelter. The province’s chief veterinarian oversaw the move and officials counted 673 dogs leaving in the first truck and 615 in the second on the third day of the dogs’ stay at the shelter. Another 680 left on two trucks the following day. 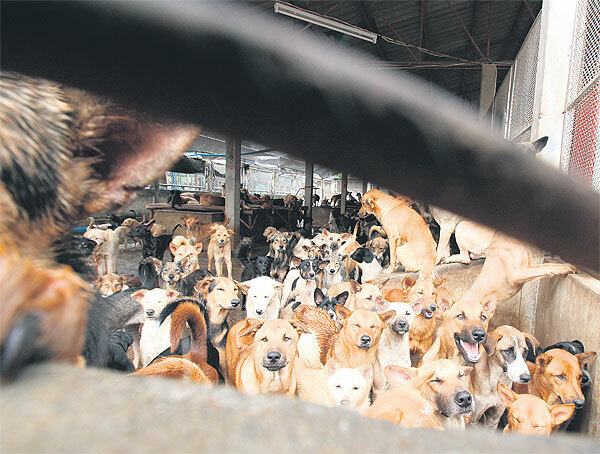 That 1,968 dogs left Sakhon Nakhon is supported by documentation given to Keeble by shelter authorities there and seen by Spectrum, but what happened to them on their way to Buri Ram remains a point of contention. Pramote Sritorn, director of the Sakhon Nakhon Provincial Livestock Office, confirmed to Spectrum that roughly the number of dogs stated in the video _ he says 1,965, as opposed to 1,968_ were seized and sent to Buri Ram. He said he received a letter from the Buri Ram shelter confirming that 1,900 dogs had arrived at the destination. However, Pongthep Ekudomchai, head of the veterinary services section of Livestock Department, said that only 1,302 of the 1,968 dogs seized from Sakhon Nakhon in January made it to the Buri Ram shelter. The rest, he said, died during transport due to poor health from their time in captivity and congestion on trucks. The Livestock Department’s numbers were based on what was reported by the Buri Ram shelter, which also included the same numbers in its official log. Keeble was not convinced by the explanation that the dogs had died en route. ”It’s usual to lose up to 10% because of the way the dogs have been treated, they just can’t save them,” said Keeble, but the loss of 700 should have been accounted for in documents. Keeble visited Phaisan Phattanadechakun, head of the Buri Ram shelter, in search of answers but came away with more questions. During a video interview with Keeble, Mr Phaisan told him that he had received 1,900 dogs from the Tha Rae bust and about 200 from a separate one, totalling 1,991 dogs after factoring in death. That ran counter to Mr Phaisan’s statement to Bangkok headquarters which listed 1,300 dogs having been transferred from the bust. Keeble wondered at the seeming discrepancy between Phaisan’s two totals and also why the Buri Ram shelter would have, according to Mr Pramote, confirmed the receipt of nearly 2,000 dogs. ”He [Mr Phaisan] is the director. It’s not a big building with 1,000 people working. It’s a very small localised operation,” Keeble said. ”But he is the man responsible for feeding the dogs, so you need to know how many dogs. Keeble found no evidence of what had happened to the dogs, but wondered if they might have ended up back in animal traders’ hands. 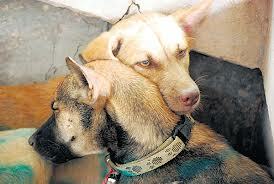 ”If the dogs did get sold back they would be worth around 270,000 baht. I haven’t found any evidence that they did but there are a lot of missing dogs and there aren’t any death records for it,” Keeble said. ”You assume these records are accurate and they aren’t in there. Livestock Department officials told Spectrum that the dogs were accounted for through deaths from disease and parasites, transfers, adoptions, or having run away. They said that extra staff were taken on to avoid dog smugglers reclaiming the dogs. Between June 15-20, concerned Sakhon Nakhon staff and Bangkok volunteers visited the survivors at the shelter in Buri Ram, estimating that there were about 300 and 400 dogs there. On July 6, they returned to find the shelter largely empty, with only about 20 dogs remaining, and those with festering sores. Mr Phaisan told Keeble that he had called on the government to provide money for livestock care. However, he could not explain where the 300 to 400 dogs seen between June 15-20 had gone less than a month later had gone. 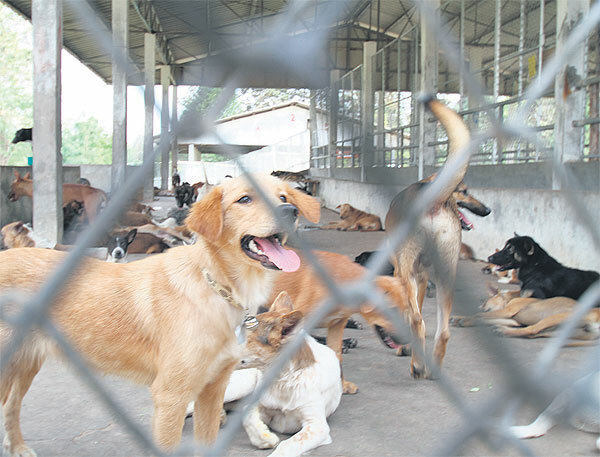 On July 24, Cherdchai Kamwijitratanayotha of the Livestock Department said that the Buri Ram shelter had been closed and that all remaining dogs had been moved to Thong Pha Phum shelter in Kanchanaburi along the Myanmar border. There is a record of some of the dogs being transferred to the Kanchanaburi shelter, but footage from a recent visit shows only around 100 of the Buri Ram dogs there. 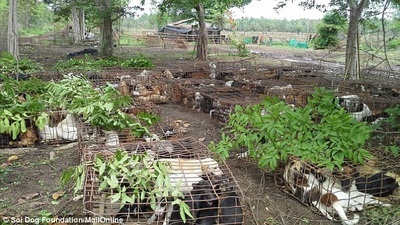 Keebler said that it means in a short time around 200 of the Buri Ram dogs had died in the new shelter. He did not have the official log for the Thong Pha Phum shelter to confirm the number that had perished. ”We went in and walked around and found some dogs in appalling conditions,” he said. Mr Dalley of the Soi Dog Foundation returned from there only a month ago. ”A lot of dogs can die in two months without any care and in those conditions,” he said. In his video, over images of the emaciated, ill-looking dogs from Buri Ram shelter that had made it to the Kanchanaburi shelter, Keeble intones. In addition to highlighting the fates of rescued dogs, Keeble hopes that his documentary draws attention to the faults in a system where greater vigilance against the dog meat trade has not resulted in a subsequent increase in government funding and programmes to care for the rescued animals. One of the reasons for the lack of funding to maintain and provide supplies for the shelters is that cracking down on the dog trade is a relatively new idea. The dogs have been delegated as livestock, but dogs are not a high priority within Livestock Department. In Keeble’s video, Sawan Sangbunglang, secretary-general of the Thai Society for the Prevention of Cruelty to Animals, says that the Livestock Department receives a budget for the care of animals such as pigs and chickens ”because those livestock are developed for economic development”. The same is not true of dogs, he said. Keeble agrees. ”A major point is that everybody has been doing their best but they have no money. It’s the funding that is the real problem,” he said. Keeble says that he is sympathetic towards Livestock Department officials who have had the problem of dealing with rescued dogs dumped on them. ”They have been given the problem but not the means to solve it,” Keeble said. ”They have never had anyone trained in it, experienced in it, and no money. Of the nearly 2,000 dogs from the Buri Ram shelter case study, Keeble could find only one that had been reunited with its original owner. ”If a case study can show that the system doesn’t work and dogs are disappearing then it is up for the people to decide what action needs to be taken at every shelter,” Keeble said. 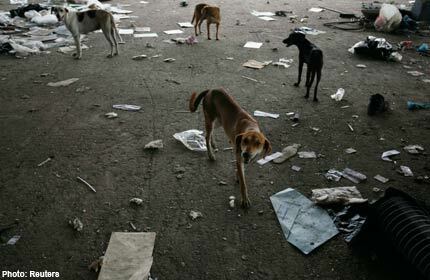 AUG 12, 2011 - A major police action against dog traders leads to about 1,800 dogs being taken in by police. Responsibility for them is handed over to a livestock facility in Nakhon Pathom. Despite the recent intensification of enforcement, the department has no funds or programmes in place to cope with the influx. Shelter staff improvise, and the public donates more than 20 million baht. Still, after five days more than 1,100 die due to disease, eating problems and the harsh climate. 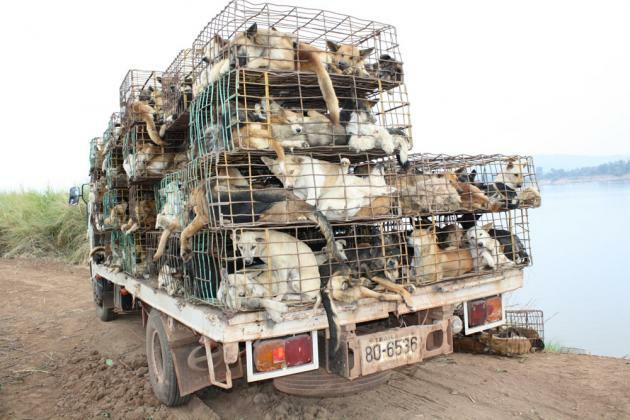 Dec 26, 2011 - A truck is stopped and 350 dogs inside are seized from smugglers. Jan 12, 2012 - The navy, leading a border guard unit, takes 800 dogs from smugglers in Nakhon Phanom’s Ban Phaeng district. Jan 13, 2012 - Police seize 500 dogs from traffickers at a roadside stop. Jan 14, 2012 - Police take in 500 dogs left in a wooded area. March, 2012 - 47 dogs arrive at the shelter after a bust in Mukdahan. In total, about 4,000 dogs arrived at the Nakhon Phanom shelter between August and March. A distemper outbreak started shortly after the dogs arrived. They had not been vaccinated and were dying at a rate of up to 30 a night. On April 22, the head of the shelter gave the total number of dogs at the shelter as 1,160. An optimistic estimate of the number of dogs re-homed would be 500, leaving about 2,300 missing. 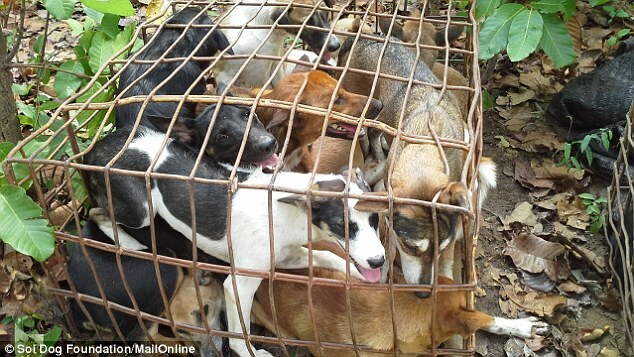 Source: John Keeble’s investigation based on shelter reports as featured in Dogs of Thailand. The dog trade has been highly lucrative business in the Northeast, particularly in Sakhon Nakhon province, for years. 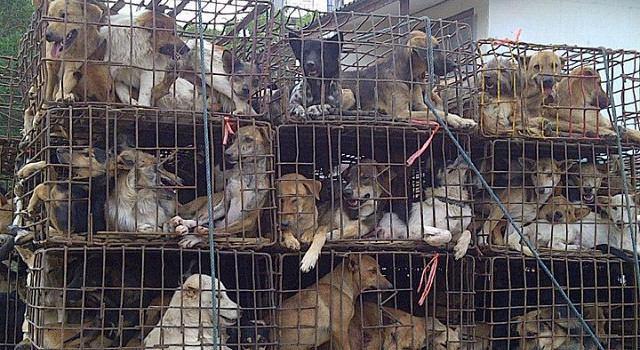 However, in the course of researching his documentary on the illegal dog meat trade in the Kingdom, Dogs of Thailand, John Keeble discovered a disturbing trend. Whereas strays used to constitute a bulk of the supply and be rounded up by villagers for a nominal costs, now more expensive dogs are being targeted, specifically people’s pets. The Soi Dog Foundation estimates that as many as 30,000 dogs pass through Thailand’s border with Laos every month via the Mekong River on their way to Vietnam. Once the dogs make it over the border into Vietnam they can sell for as much as 800 to 1,000 baht each (20-25 EUR/17-21£/27-34$). The most expensive breeds have the top price tags. 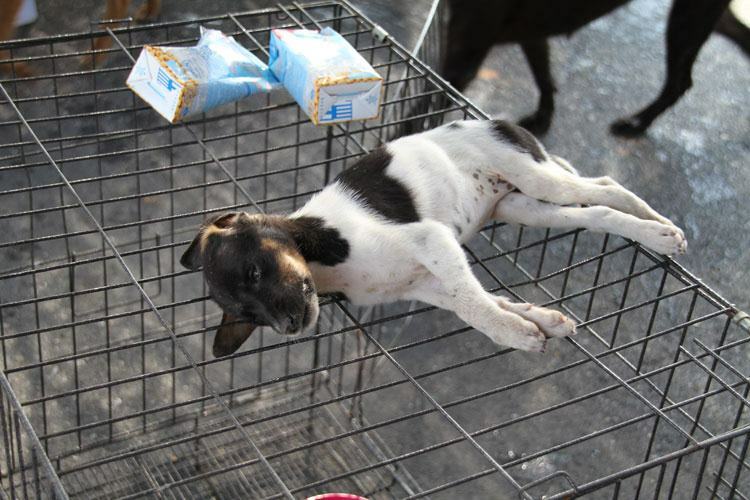 ”The old days of buying dogs in exchange for a plastic bucket from poor villagers in the area have long gone,” said John Dalley of the Soi Dog Foundation, referring to past practices where villagers would sell dogs in exchange for plastic buckets and bowls worth about 50 baht. In the first installment of his documentary, Keeble notes the effect that the switch towards pets being targeted in the dog meat trade is having, saying it is leaving ”tears throughout Thailand”. ”The dogs are dying and their owners are suffering too. The documentary investigation found many many cases of this,” Mr Keeble says in the video. ”The grandmother desperate to find the child’s dog that she was looking after when it was stolen. The people who drove from one end of Isan to the other to find their dogs.